4K Ultra High Definition Video is Ramping Up! Display technology continues to improve year after year. Even if you don’t keep up with its rapid pace, you can rest assured that your competitors will. And the latest technology that’s transforming your market? 4K Ultra High Definition video. With a resolution of 3840 x 2160, 4K UHD video material offers four times the resolution of today’s high definition standard. Furthermore, leading content suppliers are rapidly increasing the amount of 4K material available via streaming and download pipelines. This revolution is impacting a wide range of businesses. For example, Home theater, Point-of-Sale displays, and Theme Park applications are just a few of the markets that are being affected. 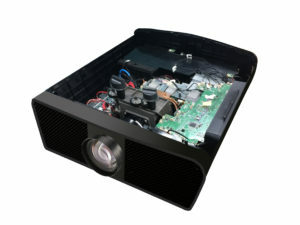 Keynote Photonics latest product is a 4K UHD evaluation projector using the Texas Instruments DLP660TE chipset. Because we combine TI’s 4K chipset with Phillips’ high-lumen-density (HLD) LED technology, the projector provides an outstanding 2100 lumens of brightness and can display the full DCI-P3 color space for a cinema-quality image. Since the 4K-HLD projector is an evaluation system, we provide you with the capability to customize it’s “look” to suit your customers’ needs. And if you require more elaborate customization, Keynote offers hardware and software services that allow us to modify the TI controller (DLPC4422) firmware providing you with the displayed video that matches your specific needs. In addition, firmware upgrades for 3D structured light solutions are also planned. Please contact us for more details. You can see the product specifications by clicking this link: http://www.keynotephotonics.com/lc-4k-uhd-hld/ . And if you have any questions, please submit a contact form and we will follow-up with you as soon as possible.